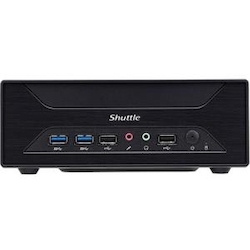 Shuttle debuts the first 3-liter Slim PC XH110G with new single-slot design to install multi-display graphics card in the market today. Equipped with Intel H110 chipset, this model also supports both Intel Kabylake and Skylake LGA 1151 processors. With Intel built-in HD graphics engine, it's deigned to support 4K/Ultra HD video content. The XH110G is a 3-liter model with strong graphics support via PCI-E x16 expansion slot for various add-on cards such as graphics card (multi-display), capture card, multi-network card, drawing graphics card, or more. The XH110G provides multiple I/O ports and high-speed storage interfaces, including USB 2.0, USB 3.0, SATA 6Gbps, M.2, and Intel Gigabit LAN It is impressively versatile and high-performance mini PCs made to by easily integrated into a variety of digital signage markets. Its slim metal chassis, including VESA mount capability, versatile connectivity and reliable operation in up to 50C temperatures makes XH110G is very suitable for workstation or surveillance and video wall applications.